The President is generally seen as exercising broad discretionary authority over developing and implementing U.S. direct investment policy, including the authority to suspend or block investments that “threaten to impair the national security.” Congress is also directly involved in formulating the scope and direction of U.S. foreign investment policy. At times, some Members have urged the President to be more aggressive in blocking certain types of foreign investments. Such confrontations reflect vastly different philosophical and political views between Members of Congress and between Congress and the Administration over the role foreign investment plays in the economy and the role that economic activities should play in the context of U.S. national security policy. In July 2007, Congress asserted its own role in making and conducting foreign investment policy when it adopted and the President signed P.L. 110-49, the Foreign Investment and National Security Act of 2007. 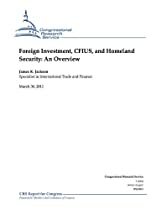 This law broadens Congress’s oversight role, and it explicitly includes the areas of homeland security and critical infrastructure as separately identifiable components of national security that the President must consider when evaluating the national security implications of a foreign investment transaction. At times, the act has drawn Congress into a greater dialogue over the role of foreign investment in the economy, and conflicts with the Administration over efforts to define the limits of the broad rubric of national economic security.